What to Look for When Finding the Best Sewing Machine? Which Type of Sewing Machine would be Right for You? What Types of Fabrics Do You Intend to Use with Your Sewing Machine? Whether you plan to sew simple garments, create intricate embroidery, make home curtains or just repair your clothes, choosing the right sewing machine for your needs is vital. Since a sewing machine is a major investment, you can’t afford to make the wrong decision and end up regretting it. There are a wide variety of sewing machines available in the market from a number of different manufacturers. 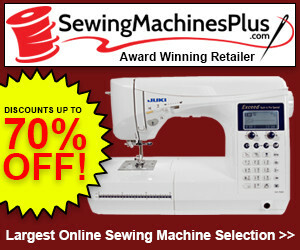 This can make it hard for you to find and buy the best sewing machine. To help you out, we will guide in choosing the sewing machine that’s best for you. So, let’s get started. If you are just starting out with sewing or only plan to sew occasionally, then a basic electric model would probably be best for you. If you are ambitious with sewing, you will need more accessories and stitches as well as features that can make sewing easier for you. When you plan to sew more often, then a computerized sewing machine would be the right option for you. Let’s take a look at different types of sewing machines available in the market. This will make it easier for you to choose the one that best suits your needs. You might have seen your grandma use one of these. Manual sewing machines were used by seamstresses in the past and they operate by turning a handwheel. Now, you will likely find these machines in a museum, an antique shop or a schoolroom. You may find one of these older models on internet auction websites. We don’t recommend anyone to get manual sewing machines as they are very hard to use and there is no point of buying them now when there are so many easy to use modern sewing machines available. Basic electric sewing machines have a motor in their body. This motor drives the needle and controls other important working parts like the feed dogs and bobbin. The motor must be manually driven by a small foot pedal. The machine’s speed can be controlled using the foot pedal – the harder the foot is placed down on the machine, the faster it will sew. Electric sewing machines offer a reasonable size and range of stitches, which you can select by simply turning a dial. They are more accurate and faster than manual sewing machines but lack many of the features available in computerized sewing machines. Computerized sewing machines can do everything that electric machines do and more. The correct length, width, and tension are pre-programmed for each built-in stitch included in the machine. They usually have a touchscreen and some models offer computer functionality allowing you to import more designs directly into the machine. Some computerized machines can memorize past work and store hundreds of edited stitches. These machines are best for advanced crafters who want to streamline their work and do more in less time. If you are just starting out with sewing or intend to only sew occasionally, go with a basic electric sewing machine. You’ll easily be able to find a good model at under $200. We recommend you look for a model that offers a variety of foot attachments as they will help you with the basic tasks like inserting a zip. A buttonhole, zipper foot and plastic foot for delicate materials is probably the right selection for beginners. You should look for a few built-in stitches in the electric sewing machine and an automatic buttonhole feature. Decorative stitches are good to have, but you will have to pay more to find a machine that offers built-in decorative stitches. Since you’ll be doing the basic work, you don’t really need to spend extra to get decorative stitches. Some brands offer accessories that you can use for decorative work. So, once you have mastered the basics, you can buy them and start creating decorative embellishments. Some of the best sewing machines for beginners include the Brother XM2701, Brother CS6000i, Janome 2212, Singer 3333 and Singer 3232. If you are looking for a sewing machine to create dresses and soft furnishings, then a mid-ranged electric or computerized sewing machine would be a good option for you. If you intend to work on more complex garments, you should look for a machine that comes with a variety of advanced features. A free arm is a must for dressmaking. You will find it extremely difficult to complete your work if your machine doesn’t have a free arm. Also, look for a machine that has an overlocker stitch which neatens up the hems and seams. If you cannot afford a sewing machine with this stitch, then find one with a close-set zigzag stitch. If you intend to deal with lots of heavy fabrics, then you should look for a sturdy machine that can feed through those fabrics without getting stuck. We also recommend you go with a model that has several machine feet – like a zigzag foot, concealed zipper foot, blind hem foot, piping foot, and narrow hem foot – as they will come in handy when you are making dresses and soft furnishings. If you are going to need a wide variety of stitches, consider getting a computerized sewing machine. Since the stitch length, width and tension are pre-programmed for each of the built-in stitches in these machines, you will be able to save a lot of time. If you intend to do a lot of embroidery work and have a healthy budget, consider investing in a high-end computerized machine or a machine that’s specifically built for embroidery. These machines have several pre-programmed embroidery patterns that you can use to create unique designs. If you want a machine with plenty of stitches and embroidery patterns, then go with a combo sewing and embroidery machines. These machines have features that will help you with both sewing and embroidery work. They are more expensive, so be prepared to shell out a lot of cash. For embroidery, it is best to look for a sewing machine that offers computer connectivity features. If you don’t, you will be limited to use the built-in embroidery patterns and won’t be able to exercise your full creative potential. With a machine that can connect to the computer, you will be able to import more patterns into it and create more unique designs. If you intend to do lots of sewing and you will be using the machine every day, buy a high-end machine. A computerized model would be right for you in this case, but make sure that it is heavy duty and can handle all the fabrics you throw at it. We have discussed the things you should look for to find the sewing machine depending on the work you intend to do with the machine. 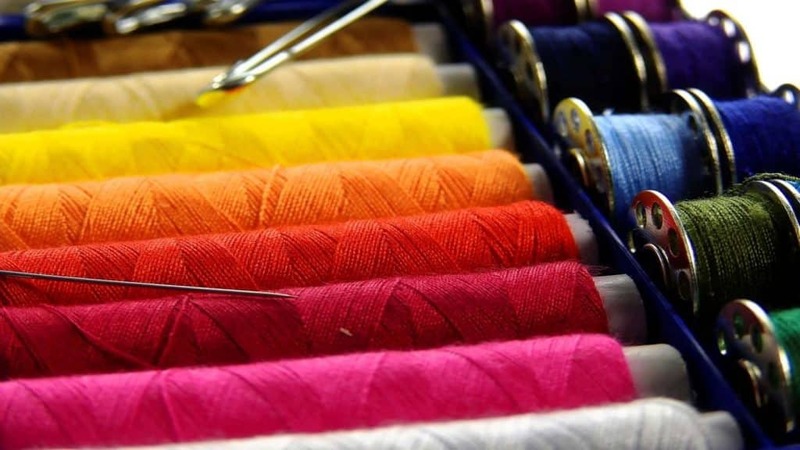 Now, another important thing to consider is the types of fabrics you intend to use with the sewing machine. Basics machines will handle cotton easily, but will likely struggle with denser fabrics like denim and leather. Thicker fabrics like denim and fleece require a relatively longer stitch length. When you are looking to find the best sewing machine for thick fabrics, search for a machine that offers a choice of short and long stitches. Delicate fabrics should be handled lightly. If you intend to use delicate fabrics the majority of the time, look for a machine that allows you to reduce the pressure on the presser foot. Teflon-coated plastic foot usually works better than a metal foot on these kinds of fabrics. So, it would be a wise option to search for a machine that comes with a plastic foot. It isn’t easy to sew stretch fabrics. Therefore, if you intend to work with them, find a machine that comes with a built-in stretch stitch as it will help you get better results. If you intend to create curtains, find a sewing machine that comes with an extension table or has a large sewing bed. Otherwise, you will struggle to handle larger panels of fabric. Every sewing machine has certain standard parts like a sewing bed, stitch selector and feed dog, but it isn’t easy to identify the additional features you need in your machine. We will discuss a few important features you should look for when finding the best sewing machine. We have already pointed out the features that you would need depending on the kind of work you intend to do, so this will only be an overview of the general features you should look for. This feature automatically measures the size of the button and then creates a buttonhole of that size. The 1-step buttonhole feature creates a buttonhole automatically, but you might have to tell the sewing machine the size of the buttonhole. 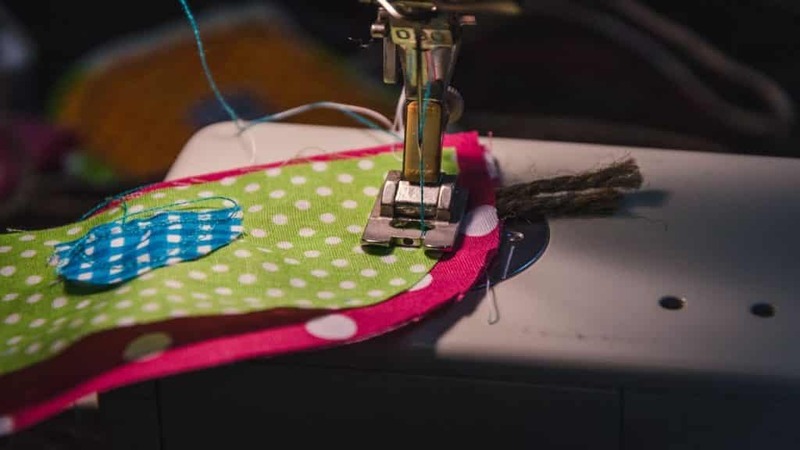 A 4-step buttonhole individually sews each side of the buttonhole by sequentially selecting stitches to create the bottom, right, top and left side. Many of the modern sewing machine especially computerized sewing machines come with an auto needle threader. This is a great feature and you won’t waste your time manually thread the needle when your sewing machine has an auto threader feature. Knee lifter isn’t found on many sewing machines. But, it is a good feature for those who work with delicate fabrics. This feature allows you to lift the presser foot by pressing a lever with your knee. So you can drop the feed dogs while keeping your hands on the work. The knee lifter makes it easy for you to move the fabric for embroidery, quilting, and when sewing around curves. In addition to the added features, you should also pay attention to the accessories that are included in the machine. Some manufacturers offer a wide range of accessories with the machine while others require you to buy them on your own. Check the accessories that you would need for your work and make sure they are included in the machine or are easily available for purchase. We hope you now understand everything you need to look for when finding the best sewing machine. We have discussed the things you should look for depending on the type of work you intend to do with your sewing machine. In addition, we have listed different types of sewing machines available in the market and the general features you should look for. The different types of fabrics you might be working and the sewing machines that would be right for those fabrics have also been discussed. Now it is up to you to carefully consider the work you intend to do and the type of fabrics you would be dealing with. Take your time to determine your requirements and the work you will be doing with your sewing machine before you make your final decision. A sewing machine is a major investment and you don’t want to end up buying a sewing machine that doesn’t suit your needs. To make the task of finding the best sewing machine easier, keep this review with you for reference during the purchase process. What Is Sewing Machine Oil and How Do I Know if I Need It? How to Select the Best Walking Foot Industrial Sewing Machine?